Glenn Cosh, DO, FAAFP (COM ’65) recalls a devout fascination he had from a young age with the stories of his elders, whether they were being told by his grandfather, aunts, uncles or parents. He was captivated by hearing lives chronicled through life’s mundane moments or the heroics of someone returning from war or even recovery from an illness. And, throughout an acclaimed career in the healing arts, Cosh—now 83 and a prolific author and cycling enthusiast—nurtured a passion for engaging patients in caring for their health, often through stories, told and untold. The thread of stories as an essential part of the human experience repeated itself throughout Cosh’s career and continues to weave into the fabric of his life today. Though Cosh retired from full time practice as a board-certified family physician in 1998, he continues performing pro bono medical services, offering accessible, high-quality healthcare at Doctors Care, Jeffco Action Center and Samaritan House clinics in Denver. He vividly remembers a young man who wandered into a clinic one night for treatment. Well educated, in his late 20s and a drug addict, Cosh’s patient revealed his tragic life story. An innate sense of empathy characterizes his distinctive style, as it did throughout his career as a family physician, as chief of family medicine at Swedish and Porter Hospitals in Denver and as president of the Colorado Academy of American Family Physicians and now in his volunteer work. A role he cherishes is husband to Erin and father to their three children and “Poppy” to six grandchildren. Cosh has always advocated for exercise and a regiment of physical activity as a prescription for wellness with his patients, especially cycling. As a youngster with a newspaper route in South Jersey, the bicycle was a means to end for Cosh, but he was also energized by the sense of freedom it gave him. Cosh took a liberal dose of his own medical advice and started cycling in earnest in the 1990s. 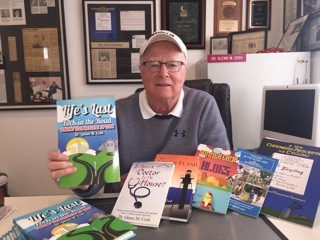 During an extended convalescence to heal a serious leg injury sustained in a skiing accident, Cosh wrote his first book, “Cycling in the Slow Lane,” in 1993. A well-written cheerleading manual, of sorts, for the benefits of the sport, the book appealed to families and non-cyclists to adopt cycling as a foundation for good health. 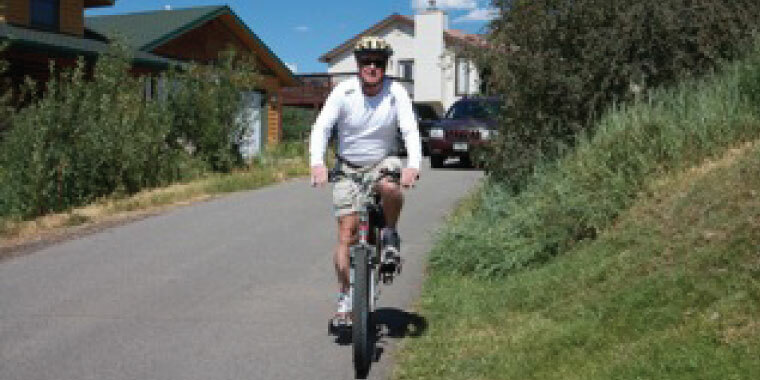 Cosh updated his book in 2010, following up with “The New Customized Prescription for Cycling.” Topics included the rules of cycling, how to be safe on a bike and more. Two more books quickly followed, including “Is There a Doctor in the House” (2013), that offered common-sense factors in dealing with the pain, fear, emotional and physical components of healthcare. One chapter addressed the importance of maintaining life balance; the book was well received by patients and doctors alike. Today Cosh logs about 10 miles daily on his bike, relishing not only the positive physical attributes of the exercise, but also its ability to destress. He gathers inspiration for his writing from time spent outdoors, on the bike. Cosh discovered notes he jotted during time doing marine research on a coral reef in the Gulf of Mexico and, after reviewing, was prompted to compile them into a book. His 2014 novel, “The Green Flash,” takes place post-Korean War, loosely based on his personal experience in the Air Force, as a young Texas A&M University-Corpus Christi pre-med student, conducting research on a coral reef in the Gulf of Mexico. “It’s a love story punctuated by hard choices, tempered by nature’s miracles,” Cosh explained. “Summer Camp Blues,” published in 2016, was Cosh’s second novel and “Life’s Last Fork in the Road” (2018) examines the meaning of heaven. Currently in progress is a book about Cosh’s time in Morocco, where he was stationed during the 1950s. “My son, a writer and movie director in Hollywood, suggested I write this as a novel,” he said. But Cosh plans to keep on riding and writing with gusto and purpose. “I still have many bike outings in me and thoughts to express,” he said, excusing himself to work on his emerging novel.